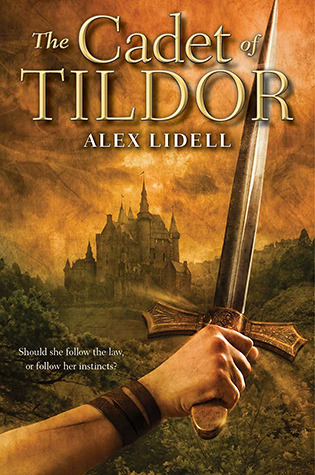 Thanks to AToMR Tours, we're pleased to present a review for a brand new YA fantasy book, The Cadet of Tildor, by Alex Lidell. Keep scrolling to check out our review and then enter to win a copy for yourself! So I have been coveting this book ever since we featured the book's trailer here on the blog back in October. The premise sounded interesting and the book and author both had already been generating some buzz. I am pleased to say that The Cadet of Tildor lived up to my expectations -- if all the books I read in 2013 are as good as this one, then we're going to be in for an outstanding year. The Cadet of Tildor follows Renee de Winter, who is studying to be a soldier to enter into service to the Crown. It's a difficult path, and by the time the story starts, she is the only girl who hasn't been cut from the soldier track at the Academy. She struggles to prove herself against the boys in her class, who are bigger, faster, and stronger. I enjoyed the fact that Renee wasn't a flawless character, and this includes the fact that she's very close to being sent home for not being good enough. I like seeing ladies who can hold their own against men twice their size, but I also like seeing ladies who have to learn to adapt to be able to fight. It's more realistic than just "knowing" how to fight off men who are stronger than you. Renee struggles, she makes mistakes, and then she learns from them, without ever being arrogant. She wallows a bit in misery when some bad things happen, but in this case, it seems like some well-deserved wallowing and she eventually moves past it. This story is just awesome. There are enough political machinations to satisfy fans of meaty universes like Jacqueline Carey's Kushiel's Legacy series or George R. R. Martin's A Song of Ice and Fire books. It can be challenging to put all of the pieces of the puzzle together to understand who is fighting against the Crown and why, but I don't think that a plot involving lots of layers of political intrigue should be so easy to put together. There are some genuine surprises in the book, and all of the characters experience a lot of growth, which is something you don't always see. Korish Savoy, a military commander temporarily reassigned to teach Cadets, is someone who Renee goes from seeing as an untouchable idol (true) to an immature jerk (also true) to a trusted friend (true). I would read a book just about Korish because he is a pretty complex guy who we mostly only see through Renee's eyes. And -- here's my favorite part of the book. No love triangle. I am pretty much sick to death of this love triangle nonsense, and I kept waiting for it to creep in here, but no! Renee shares a cozy date-type-thing with one character, and there's some subtext between Renee and some others, but no one is competing for her affections, and any romantic feelings any of the characters may have are put off due to the fact that they've all got bigger problems on their plates, like, oh, war and kidnapping and possible death. I have my own personal feelings on who I'd like to see Renee with, but I was pleased with the fact that it wasn't shoehorned in - there's enough plot already and I think the story would have suffered if it took that turn. I had a few small quibbles with this book, some of which are things which may have been addressed between the ARC stage and publication. There were some stilted passages of writing which made it difficult to understand the direction of the action, and sometimes characters and situations are just introduced as though you're already familiar with them. There are also some abrupt shifts in point of view which threw me for a loop - most of the story is told through Renee's perspective, but it shifts a few times to be through Korish's perspective as we follow what happens to him. I'd recommend this book for fans of fast-paced character-driven fantasy, especially people who enjoyed books like Throne of Glass or Grave Mercy. Goodreads doesn't say that this book is part of a series, and it stands very well on its own, but for the first time in a long time, I find myself hoping that there's another book somewhere down the line.